I’m approaching almost two months since I’ve completely changed my skincare routine and replaced my old products with Guerlain Skincare. I changed my previous skincare routine as I finished all the products from the brand I was testing and since I saw that my complexion was not looking as good as it used too, I knew I had to turn to some higher quality skincare products so I choose Guerlain. I bought all these products myself, from Douglas Perfumery so there’s no point in sugar coating this article and the results I’ve been seeing for the past few weeks. I know Guerlain is categorized as a high luxurious brand when it comes to its products (especially prices), but when considering the history, high quality and results of their skincare products I find that at least once it is worth investing and see the results for yourselves. It has been a little over a year since I gave up using skincare products from La Prairie, La Mer and Swiss Line which I’ve stated all these years that they are my favorite brands when it comes to skincare. Over the past year I’ve been trying out, testing and getting to know other skincare brands as well, but I definitely can’t say that I had the same results or that my skin was looking as fresh, rested and radiant like when I used the products from the brands mentioned before. So after one year of playing with different other skincare products, that I can’t say they were all bad, but didn’t offer me the quality of those that I was used too, I said I must raise the bar once again and start using on my skin only those products I found it works best. I must say that buying luxury skincare items from Romanian stores is not an easy investment so I admit that I took my time before choosing these products, read a couple of reviews and also got some samples in the stores with every occasion that I could. I decided to try out Guerlain skincare items as I’ve been in love with their makeup products for the past two years and the more products I tried out the more I loved them. I knew about their amazing skincare products (I’ve been blogging about some of them in the past) but I wanted to see the results on my skin. For me when choosing to start a new skincare routine from a brand that I haven’t previously tried is important to do a research of the brand, read reviews but also talk to a Beauty Adviser in the store, who is specialized on the brand and can answer my every question and recommend the best products for me. I admit that over the past few months I’ve been shopping for Guerlain at Douglas Baneasa, as I also have a card there but I’m always getting the information I need plus some extra tips or advises. For me the way my complexion looks when I’m bared skin is more important that how I look with my makeup on, so I’ve always invested more in my skincare routine rather than makeup products. I bet everyone wants to feel comfortable in their skin when they are not wearing makeup so I always made financial efforts when it came to skincare products. 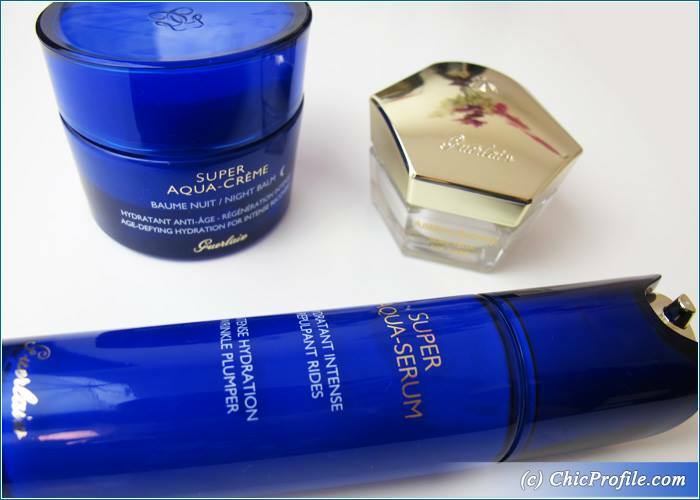 I admit I spent a little fortune when I chose Guerlain Super Aqua Serum, Super Aqua Night Balm and Abeille Royale Eye Care but I knew these products will be in my skincare routine for at least 5 months and not to mention that as a blogger I was always curious to see for myself is they can deliver what they promise. Being almost in my mid 30’s of course I’m concerned with wrinkles, especially around the eyes (lately some dark circles, I admit), signs of fatigue, lack of radiance, hydration and I want a firmer and fresher looking skin. I want to look as I was in my mid 20’s even when I’ll be approaching 40 so you can’t blame me for investing in my skincare routine. I’m a combination skin type so I knew from the beginning that face creams applied in the morning or during the day were not for me. I know they rich, hydrating, they may have incredible visible results but not for me when I’m trying to look my best and keeping a shine free complexion, especially when I knew I’ll be using these products during the hot season. 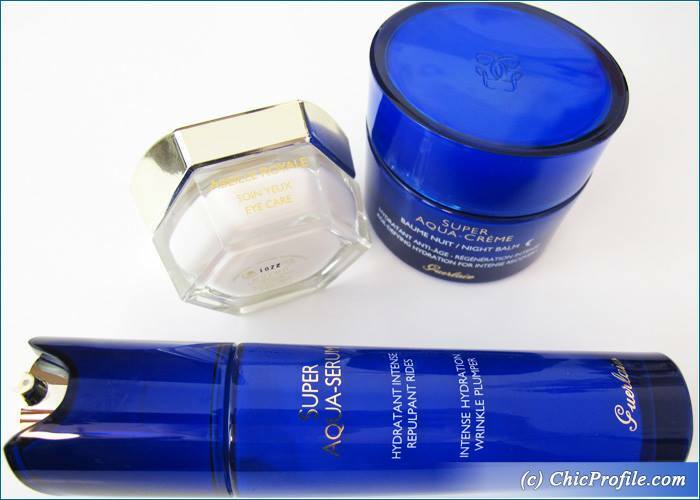 I’ve always leaned towards face lotions or serums so after getting a few samples of Guerlain Super Aqua Day Cream and Day Gel which I used for about one week, I decided I want a lighter formula, one that I can feel comfortable using during the summer and also with an anti aging effect. 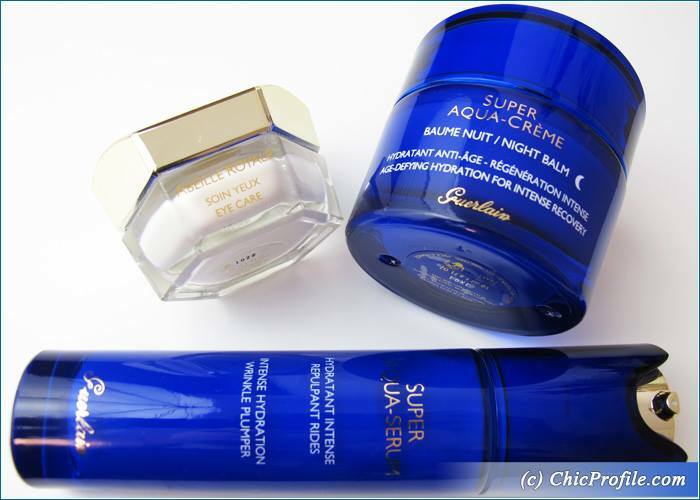 I choose Guerlain Super Aqua Serum , intense hydration wrinkle plumper which has been a best-selling products in the last 25 years. It promises to plump up fine lines and wrinkles while smoothing skin and giving back with radiance and freshness. At this point I just wanna tell you that I’m so happy with my purchase, it’s the right product for a combination skin type, feels so lightweight on the skin, it skins almost instantly into the skin…but I’ll tell you more in my upcoming review. For me the most important skincare product it has always been my eye cream. What can I say…I don’t want wrinkles around my eyes, especially the famous crow’s feet…and my eye cream has always been my main concerned and a big investment. Guerlain Abeille Eye Care is amazing when it comes to wrinkles concern, signs of aging, puffiness, fatigue and loss of firmness in your skin. Not to mention that my skin is looking so much younger know (even with only some of hours of sleep sometimes) but it has visibly improved my skin condition and repaired signs of aging. I just don’t want to reveal too many details about the effects this product had for me until my upcoming review, so please check out the blog in the upcoming days if you are interest in hearing more about this product. Last but not least, my nights always start to Guerlain Aqua Creme Night Balm which provides a 24-hour- age-defying hydration. Enriched with the benefits of Aquacomplex, this amazing night recovery balm restores a youthful appearance, providing the skin with so much needed hydration while smoothing away fine lines and wrinkles. I’ve also had some deluxe sample sizes of Guerlain Satin Milk Pure Radiance Cleanser and Abeille Royale Honey Nectar Lotion which I used in the first two weeks. Pairing products from the same brand is always more efficient than using skincare products from different brands, not to mention that will make you see results much faster and decide if these products work for you or not.